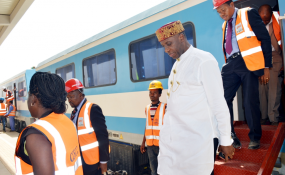 Ahead of the May 29 second term inauguration of President Muhammadu Buhari when he is expected to dissolve his cabinet and constitute a new one, the minister of Transportation, Rotimi Amaechi on Friday said he hoped that the next Transportation Minister would have the same zeal and passion especially to deliver the ongoing projects in the railway subsector. There are fears many ministers might not form the next cabinet of President Buhari but it is believed that Amaechi who was the Director General of the Buhari Campaign Council would return as a minister. However, the minister was quick to add that his reappointment is the prerogative of the President who has the statutory power to appoint ministers. Amaechi was responding to questions from newsmen today during a routine inspection of the ongoing Lagos - Ibadan standard gauge project being undertaken by the China Civil Engineering and Construction Company (CCECC) where he tasked the contractor to complete the civil works before the commencement of rain. Amaechi who drove himself throughout had many stops and took several kilometres of walk to assess the level of work carried out on the project even as it was revealed that some of the workers left the site because of the just-concluded general elections. Asked if he was not exhausted, the minister said he believed he had a responsibility given to him by the President to deliver the railway projects and he must do it passionately. On whether he was worried that he might not be reappointed, he said that would be determined by the President, adding, "If you watched me as governor I was always restless at delivering on my responsibilities. I pray whoever would be the Minister for Transport should have the same passion and focus on that responsibility. "I know as a Minister, I know it is a stress, I'm stressed up and all that. But as a Minister you have a responsibility that the President has passed to you and you must deliver. "The second thing is that the economy of Nigeria can be driven most importantly if you can link the seaport to the hinterland because when these cargoes come, they must go. The more you are able to move goods and cargoes to the hinterlands, the more you create jobs; and the more you create jobs the more economic growth that you have." Amaechi at every stop urged the contractor to deploy more equipment on site to fast track the pace of work especially the civil works and laying of tracks. From Iju in Lagos, the track has been laid up to kilometre 82 in Abeokuta with the contactor assuring the minister that the tracks would have been laid up to 95 kilometres by March 28.